If you are planning to enter the Korean marketplace it is worth noting that there are some major differences in the online marketing area. Almost everywhere in the world we can rely on Facebook, Twitter and similar platforms for our social media marketing and Google ranking for websites. In Korea while Facebook, Twitter and even Pinterest are social platforms to think about as well as Google (gaining ground on mobile devices), Naver and Daum are dominant online for both blogging and search engine usage. As you can see Naver clearly dominate in this area with 67.8%, followed by Daum with 21.8% and finally Tistory with 6.7% of the market share. Why blog marketing in Korea? Simply put 78% of Korean consumers make a purchase because of recommendations or reviews from previous customers. 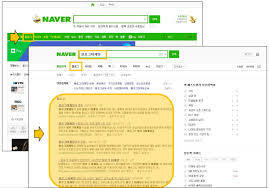 41% of Korean consumers move to a blog search after a general search on the two major portals – Naver and Daum. The category ‘Blog’ is very prominent in the menu bar at the top of Naver as you can see below. You can also see that the ‘Blog’ search section is the first section seen on a default Naver integrated search. Having your blog in this section in one of the most crucial online marketing techniques in the Korean market. There are some key elements to consider when creating/using a Naver (Daum) blog for your company. Marketing in a new territory is always challenging, some issues can be culture differences, language and local consumer understanding. While it is possible to create your own social media and blogs using them effectively is very different. When entering a new space for your business think carefully about your strategy and consider using companies and people already on the ground to help you. If you found this post helpful please share the knowledge through your social media platforms.